St. Rose was founded in 1854. The origin of the parish can be traced to the opening of coal mines in Cannelton in 1838.
celebrated the first Mass in Cannelton in a private home. For the remainder of the decade, Rev. Reid continued to periodically visit the town and celebrate Mass in private homes. In 1855, the railroad came to Cannelton. This event accelerated the growth of industry and population in the area. By 1861, the Catholic population grew to the point that a church was needed to accommodate the number of people attending Mass. On October 25, 1861, land was donated for a church and in the next month a rough one room wooden church was built. In 1862, St. Rose became a mission of St. Mary, New Castle. In 1864, responsibility for St. Rose was transferred to St. Joseph, New Brighton. The church, which had originally been considered only a temporary expedient, was soon inadequate to serve the growing congregation. On August 2, 1871, the Harmony Society of Economy donated land for a new church. 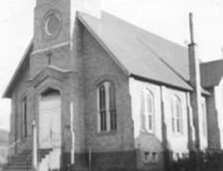 The church was rapidly built and dedicated on October 22, 1871. The original church was renovated and converted into a school. However, shortly afterwards the mines began closing and families began moving out. The school was closed in 1875 but the building was later used for catechism classes until 1900 when it was torn down. Two years later, the first resident pastor was assigned to St. Rose. The pastor also had responsibility for St. Teresa, Koppel (then located in Hoytdale but called Clinton at that time). St. Rose had a resident pastor until 1895 when St. Agatha, Ellwood City was founded. In that year, St. Rose became a mission of St. Agatha. In 1898, St Rose became a mission church of St. Mary, East Palestine, Ohio. This arrangement came about with the agreement of the bishops of Pittsburgh and Cleveland. This situation continued until 1912 when St. Rose again was assigned a resident pastor. This church served the congregation well into the twentieth century. In 1959, a building fund for a new church was started. Land was donated for the church about two miles away from Cannelton. Ground for the new church was broken on April 28, 1963 and the completed church was dedicated on June 21,1964. The church was renovated in 1984 including replacement of the roof and the addition of a new steeple. St. Mary was founded in 1871 as a German ethnic parish. The origin of the parish can be traced to the arrival of German Catholics in Beaver Falls (then called Brighton) in the 1860’s. These Catholics had to travel to New Brighton to attend Mass. Due to the difficulty of traveling to New Brighton and to a desire to hear the Gospel in their native language, a group of local Catholics purchased two lots of land for a church. Construction of a church began in 1871 and the completed church was dedicated on July 4, 1872. For the first decade the parish did not have a resident pastor and was visited monthly by priests from St. James, Sewickley and Holy Trinity, Pittsburgh. In the spring of 1886 the first resident pastor was assigned to St. Mary. In 1895 construction of a new church began. The completed church was dedicated on May 16, 1897. The old church was converted to classrooms for the expanding parish school. A new school later replaced this in 1924. In the early 1920’s, the parish was designated a territorial parish. The church was renovated in 1947, including the installation of a new altar. Seven years later, new stained glass windows and pews were installed in the church. By the early 1990’s, the drop in industry and population in the Beaver Valley meant that Beaver Falls could no longer support two independent parishes. 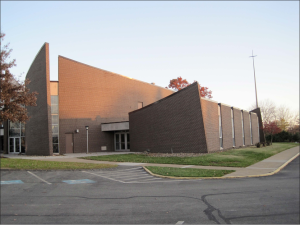 In 1994, St. Mary and Holy Trinity merged to form the new Divine Mercy parish. Holy Trinity parish was founded as a Polish ethnic parish in 1910. The founding of the parish was a result of the arrival of Polish immigrants in the Beaver Valley. By 1910, the Polish population had grown large enough to support an independent parish. 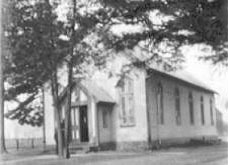 The new congregation purchased an existing Lutheran church and dedicated it on October 30, 1910. However, in 1916, work began on a new combined church and school. The cornerstone for the new building was laid on December 3, 1916 and the building was completed shortly afterwards. The original church was remodeled and used as a school annex and later as a social hall by the parish. As the rise of population in the Beaver Valley in the beginning of the century led to the creation of the parish, the subsequent drop of population at the end of the century led to its end. 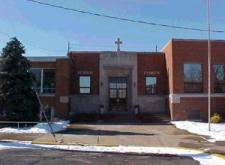 In 1994, Holy Trinity was merged with St. Mary, Beaver Falls, to form the new Divine Mercy parish. St. Ann was founded in 1922. Before that year, the Catholics of New Galilee were periodically visited by a priest from St. Rose of Lima, Darlington. At other times, they traveled to St. Rose or to Beaver Falls or Ohio to attend services. At first, Mass was held in private residences. When Lombardy Hall was built around 1919, this building was used to celebrate Mass. In 1922 a meeting of local Catholics made plans to build their own church. In March of that year, land was purchased for the church. Ground was broken for the church on June 19, 1923. Although the church had not yet been completed, the first Mass in the new building was celebrated on June 29, 1924. Despite the fact that the bell tower was not yet completed, the church was dedicated on November 16, 1924. The tower was completed two years later and the bell was blessed on June 22, 1926. The parish was a mission of St. Rose. In 1948 the church was extensively remodeled. By the end of the century, the population of the area dropped significantly. In 1994, the decision was made to merge St. Ann with St. Rose. The church remained open for a while after the merger but attendance continued to stagnate. By January 21, 2001, Masses were no longer regularly scheduled in the church. After a study by the parish pastoral and financial councils, the decision was made to close the church. The final Mass of the church was celebrated on June 3, 2001. St. Ladislaus was founded in 1923 as a Hungarian ethnic parish. The parish was the result of an influx of Hungarians to the area at the beginning of the century and their desire to worship in their native language. The first Mass for the parish was held at the Polish parish of Holy Trinity. In 1924, the congregation purchased the old First Reformed Presbyterian church, which had been built in 1878. The church was dedication in September, 1924. 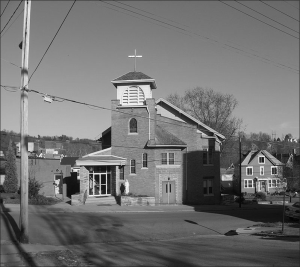 Beginning in the 1950’s, the congregation began to decline as people began moving away from Beaver Falls. 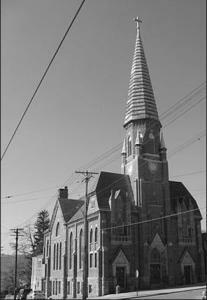 In 1969, the church no longer had a resident pastor and was administered by St. Mary, Beaver Falls. By 1985 the congregation had dwindled to 88 parishioners. A study by the diocese concluded that due to the small congregation and the lack of priests, it was no longer viable to keep the parish open. On September 27, 1985, the parish was officially suppressed. St. Philomena was established in 1948. The origin of the parish can be traced to a parish census taken at St. Mary parish, Beaver Falls. That parish was considering enlarging its church at the time. The census showed that over 20% of the congregation lived in and around the College Hill section of town. 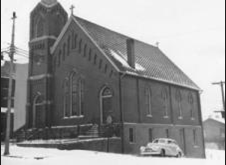 Rather than enlarge the church, the parish made plans to start a parish in College Hill. In 1948 the diocese issued a directive establishing the new parish and the first Mass in the parish was celebrated on October 3, 1948, in the College Hill fire station. 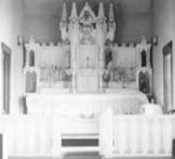 At first the parish was a mission of St. Mary, but on January 20, 1949, a resident pastor was assigned. In 1949 land was purchased for a church and fund raising began. The next year work began on a temporary church that was planned to convert to a school. The cornerstone of the building was laid on October 29, 1950, and the completed building was dedicated on October 21, 1951. On September 21, 1958, ground was broken for a school addition to the church building. The cornerstone of the school was laid on November 16, 1958, and the school was dedicated on September 27, 1959. At one time there were plans to build a new Church, however due to the changing dynamics of Beaver Falls these plan were dropped. Christ the Divine Teacher was established on June 2, 1969. 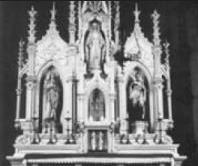 The first Mass of the parish was celebrated in St. Mary Cemetery Chapel on June 7, 1969. Until the church was built, Mass was celebrated in a local restaurant. Ground was broken on July 26, 1970 for a structure called a “multipurpose space and catechetical classrooms (functioning as a temporary Church)”. The first Mass was celebrated in this space on March 27, 1971, and the building was dedicated on May 31, 1971. Additional work was done in 1974 to add a hall, and at that time the “temporary Church” become a permanent Church with the installation of the pews. 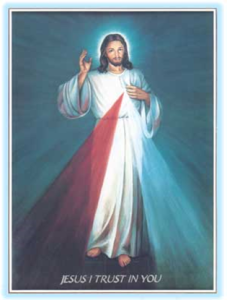 Divine Mercy was established on February 12, 1994, as part of the diocesan reorganization and revitalization program. The parish was formed by the merger of the two existing parishes in Beaver Falls, Holy Trinity and St. Mary. The parish later determined that they did not need two church buildings. 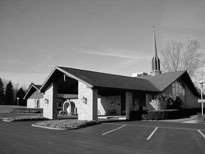 On March 19, 2012, the parish closed Holy Trinity Church. The former St. Mary Church was re-titled Divine Mercy Church. Later that same year the remaining Church building was also closed due structural problems, which deemed the Church unsafe.